The monastery was founded on March 27, 1987 by three nuns from Romania with a desire to pursue missionary work and to contribute to the growth of Orthodoxy in America. This vision had to be fulfilled through a monastic structure; not by importing or re-creating a glorious past, but by drawing on the traditions of the past that keep alive the Orthodox faith. Originally the Monastery's home was in Terra Haute, Indiana, and was dedicated to St. Andrew the First-Called. In January of 1988, the Monastery began its permanent life in Rives Junction, Michigan and was dedicated to the Dormition (falling asleep) of the Mother of God. Devotion to St. Andrew has continued without interruption since the original founding, though in less visible ways since moving to Rives Junction. The first chapel has been dedicated to St. Andrew and his tropar is sung daily. After five years as the first abbess of the monastery, Mother Benedicta retired from those responsibilities in 1992. On August 15 of that year, at the feast of the Holy Dormition, Mother Gabriella was installed as the second abbess. 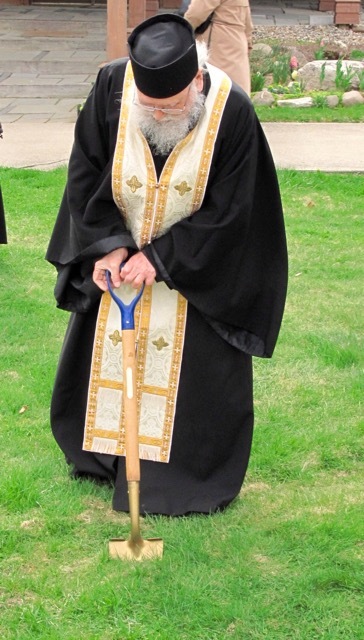 The Great Schemanun Benedicta fell asleep in the Lord on August 7, 2005 and lies in the cemetery of the monastery. By the grace of God and with the help and support of many faithful pilgrims, the monastery grew gradually but persistently in those early years. The Rives Junction property acquired in 1987 included an old farm house and a pole barn. The farmhouse became the housing for the nuns, and served as a temporary chapel. The nuns moved onto the property in January of 1988 and the first Liturgy was served in the farmhouse in April of that year. Eventually the pole barn was converted into a chapel, now dedicated to St. Andrew, which continued for 25 years to serve as the main church of the monastery. A summer pavilion which houses the annual Pilgrimage of the Dormition of the Mother of God on August 15 was an early priority. In 1994 an overall plan for the development of the monastic complex was finalized, and on Bright Saturday of 1995 the blessing and ground breaking ceremony took place for the first construction phase of the site plan: the kitchen and dining hall (Trapeza). This was followed by a guest house which was completed in the Fall of 2001. A new house for the sisterhood with offices, work rooms, and a private library was completed in 2004. In 2006 a gift shop (lower floor) and museum (upper floor) attached to a stone bell tower were completed. A separate guesthouse for monastics and hierarchs, dedicated to St. Nicholas, was later added. In the cemetery, a small Romanian style wooden chapel was finished in the summer of 2009 and dedicated to St. Lazarus. In the spring of 2010 work began on the main Church, which was consecrated on October 6, 2012. Work on the iconography of the Church continues. Over the years, other projects have been accomplished including the construction of a large garage, a monastic prayer skete in the woods, and a monastic workshop with an iconography studio. Adjoining properties were also added to the monastery property including wooded and farm lands as well as a residence for the priest of the monastery, which is dedicated to St. Nektarios. A cemetery, ponds, flower and vegetable gardens, and a children’s garden have also been created as well as walking trails, an orchard, vineyard and greenhouse. Our monastery is built by the love, hard work and financial support of many pious and dedicated people, who fulfill the words of the Scriptures--doing everything in love, multiplying the talents and laying up treasures in heaven. We celebrate all of you who stand behind our mission, and we give thanks to God always for you. We thank you for carrying the burden with us and may God grant you many years unto Salvation. I was initially somewhat worried regarding the courage the nuns had to establish a monastery in Rives Junction, in a wild and deserted place, on the site of an abandoned farm, and having neither a bank account nor any money. Twenty years later however, the miracle is visible: stone and wood construction that inspires piety when you see it; a modern kitchen and a dining hall with iconography on the walls; the guest house with two conference rooms and lounge for conferences and retreats; the bell tower out of stone with a roof in the northern Romanian style, attached to the museum and the gift shop; a guest house for hierarchs and priests; a separate house for the monastery priest; then the house for the nuns with cells, office space, sewing rooms, library and iconography studio; the extension of the property by the acquiring of adjacent land; the creation of gardens for meditation and prayer, the newly completed chapel in the cemetery…. all of these are mysteries only God and His Holy Virgin Mother know. The nuns never collect money in church or at the lunches; they invite all pilgrims to participate. And there are no fees for pilgrims who come and stay at the monastery, each contributes according to their own means. Then what is the mystery of this extraordinary help given by God? It is the prayer of the nuns, and God always sends help. They do not beg people, but they do pray to God. The monastic rule of prayer and the liturgical cycle has never been interrupted in this monastery.